& I both worked Xmas day...). the gifts weren't many, but everyone was pleased with what they got. Mom & Dad &John were here for supper Xmas eve, Koren brought homemade candy &corn casserole, mom brought noodles. Xmas afternoon we visited at Marie's, Lije &Jo were there. Xmas nite Katie & I went to supper at Norma & Ed's with Koren & Cody. sunday nite we took down the tree. Koren & cody moved into their new house Xmas week. once upon a time we moved close to Xmas, had to move wrapped gifts! We've had a wonderful year here at 512 S. 1st, Carbondale, KS and we're very grateful to our Good Lord for that. We hope you and yours have had a good year, too. Our thoughts and prayers go out to all our friends, relatives, and acquaintances who are suffering with health problems, have lost loved ones and the many conflicts of daily life. I'm feeling especially happy as I write this letter because it is the first time in about six years that I am truly "in" a Holiday mood! I actually put up a Christmas tree for the first time in several years and I have transformed our "Entry Room" into a "Christmas Room". Jokingly, I told Kent that this must mean I have been healed emotionally, and he answered with "Well, you're getting better." Bless his heart. Kent works with his friend in a home repair business, but only when he wants to, so he is still retired, mostly! He has worked hard on our property this year. Mowing was the largest project since it rained all spring, all summer, all fall, and is still raining right into winter, although twice we had nice wet snows in Nov. instead of rain. It is almost Christmas and our lawns are just as green and plush as they were this summer. Kent planted a nice vegetable garden and we had produce galore-no, I didn't do any canning this year, I'm not that "healed emotionally!" Maybe next summer. The nice thing about the garden-we didn't have to water ever except right after he planted the new seedlings. God did all the watering for us and he kept our pond full, the frogs happy, and the grass growing and growing. Kent also made flower beds for me so I could plant beautiful flowers of all kinds. Ah, it felt so great to be out in the great outdoors again and putting my hands in soil. We didn't have the number of snakes this year like last year and I didn't have as much poison ivy to fight, either. The spider count seems lower this year, too, but the ants were horrific. We enjoyed watching the antics of the mama red fox and her four babies for awhile but they were burrowing under our sheds and making paths. They also killed song birds, cats, and a Cottontail rabbit and her babies. We were just about to call Animal Control when they took off for somewhere else. We also got to enjoy seeing a mama duck and her babies on our pond. Oh, and we had apples galore and we didn't do a very good job of keeping them off the ground, either. My poor sister Tammy has over twice as many trees as we do and she would get those apples off the ground as fast as they fell. She had some really good apples, too. Ours weren't very good. Ours are late ripening apples and fairly small. Next year we're either going to get them sprayed to keep the bugs and worms away or else we're going to cut them down! Kent had cataracts removed from both eyes in April. His eyesight was getting so poor and he knew it was effecting the quality of his work. He had no problems at all with the simple surgeries and now has 20/20 vision in both eyes. He is now enjoying a world of beautiful color. He even could see what I looked like and he hasn't left yet! amazing! He enjoyed the spring colors of the flowering bushes and trees for the first time in probably 20 years. He was so awed by the beauty of the Bradford Pear Trees that he bought one and planted it in our yard. I have had a very healthy year and even though I feel pain most days, the pain is not severe and I am so thankful for that. It is wonderful to feel good for a change. I am still at Washburn University Law School in the Library. I enjoy the students so much, but after three years they graduate, must pass the bar and then they move on. Even though it is a great occasion for them, it is sad for me. KEnt & I took several trips this year--I know, some of you wouldn't think of the places we go as trips, exactly, but for us they are. We took a trip all around the perimeter of Kansas with a side trip to Oklahoma with son Cub. We spent several days with Cub in Arkansas City, visited Kent's sister Barbara; went to Colby to see my Aunt Zelma Reed, and picked up Jared so the three of us could spend several days in Syracuse with Dustin, Karen, Brett, and Cody. Kent, Jared, & I took care of the boys one day while Dustin and Karen were working. We took the boys out to the golf course so they could practice their putting. Cody is just 3 years old and loves to golf! Brett is nine and is not only involved with golf, but swimming, baseball, basketball, football, bowling, reading, playing the piano and does wonderful in school. We watched them do "safe" fireworks on the 2nd of July and they had an early birthday party for Kent. We took Jared back to Colby and stopped to see Ron & Peggy Young and then on to Brewster to have dinner with Bonnie and Warren Reid and Sue & Dwayne Randolph. We spent the night with Sue &Dwayne adn then headed for home on the Fourth of July, KEnt's birthday. When we got home we picked up some chicken at the deli and headed for a big celebration at my brother David's mother-in-law's place. The fireworks that night were so beautiful. Cub, Leigh, & Justin came back to our house afterwards and set off their own fireworks whle we watched the brilliantly lit sky around us. We live in the perfect place for watching fireworks. Another trip we took was with David and it was a one day affair driving to Pontoon Beach, IL just northeast of St Louis, MO and back to Carbondale. David was getting ready to leave for Lakenheath Air Force Base in England and had to drive his pickup, while we followed in the van, to Pontoon Beach so it could be shipped to England. It was the first time Kent had ever seen or crossed over the Mississippi River before. One of Kent's cousins (that's you, Warren!) was totally amazed that Kent was as old as he is and had never been that far east. Lke I wrote earlier, our trips aren't like most peoples trips! We don't venture far from Kansas, although I have been as far north as Canada, as far east as New York, as far west as California, and as far south as Texas. Kent has been as far west as Utah, as far north as Wyoming, and as far south as Texas, he can now add as far east as Pontoon Beach, IL! We took a little weekend trip to Council Grove KS in Oct. as a late 39th wedding anniversary trip. We saw all the historical sights there, walked the Neosho River Walk, visited the Kaw (Kansa) Indian Museum, attended an outdoor historical pagaent called "Voices of the Wind People" a history of the Kansa Indians and Council Grove. Native Americans came up from the Kaw Indian Reservation in Oklahoma to take part in the pageant. It was a cold evening and when Kent started to complain, I told him to just pretend he was at a football game! We enjoyed the trip very much. While David was home we had a big backyard bash. There were 57 friends and relatives there. We sure worked hard to get this place as spiffy as we could. Dustin, KAren and boys came a few days early and helped us. Karen was such a great help to me and I couldn't get over how hard that girl could work. The party wouldn't have been such a success without them. Even Cody got into the act by helping his Uncle David pick up apples and dump them between the pond and the creek for the deer. We had great food, lots of outdoor games to play, a seed spitting contest and my sister Coleen and even my mom did the spittin' thing! We had great music provided by my cousin Linda and husband Gary Kentch. Many people walked though the house for the first time, so it was kind of an Open House thing, too! Grandson Brett surprised us all by standing up in front of all those people and singing the country song "When the Sun Goes Down." Jared is at home with us right now for the holidays. He has had a good year & even held down a job at the Sonic for three months. I think the only reason he quit was because he got to thinking about the possibility of not getting to come home from Christmas. He is very active with bowling and an organization called CRO and serves on the governing board. It is an organization for the mentally disabled. He stays active with his group at Colby House, too. Cub comes up to Topeka almost every weekend to see Leigh and Justin and us most times. He still works at the Golf course in Winfield, KS. I think he is contemplating a move to Topeka one of these days, which would be nice for him because he wouldn't have to drive that six hours every weekend and I'd feel better about him not being on the road all the time. He bought a new car this year. So did son Jesse and my parents. It's about my turn now since I lost my little Ford Probe in May. It finally just couldn't take it anymore and died in Maryville, KS on a return trip home from a fishing expedition to Norton that Kent and Dustin took. cub & I had to drive to Maryville to save Kent! It was a good little car and had been driven by Jesse and David, besides me and Kent. Jesse is still Sgt. Doze and an instructor in Marine Combat Tactics Training at Camp Geiger (Camp LeJeune) in North Carolina. He lives in Jacksonville with two roommates and five cats that he's taking care of while the cat's owners is serving time in Afghanistan. Jesse was home in Nov. for a week. Only a few people knew he was coming home because he wanted to suprise his Uncle Fred Marstall and wow, were they all surprised! Some high school classmates of Fred's had an early surprise birthday party for himat Coyote Canyon. Jesse drove from Jacksonville, NC and while everyone was just getting ready to eat, Jesse called to say he was outside and would brothers Cub & Dustin go out to help him. anyway, Jesse came in full dress uniform, along with his sword and marched through the restaurant with Cub & Dustin following. He went straight to Fred and greeted him. Fred was overwhelmed and so were my parents and other relatives who had no idea he was coming. Jesse presented his Uncle with a Letter of Commendation from the USMC (his commanding officer wrote it up) and from what I understand, it is rare for a civilian to receive such an honor. Jesse also presented Fred with a USMC coin, also from his commanding officer. Then Jesse presented Fred with the rarest of the four internal recruiting posters that feature Jesse as the instructor. We're not done yet! Jesse then asked his uncle if he would accept his sword and then surrendered his sword to Fred. It was an awesome ceremony and there were people who weren't even with our party crying. Fred is in his fifth year of ALS, Lou Gehrig's Disease and Jesse loves and cares for his uncle very much. Kent & I were so proud of Jesse. We're proud of all our sons. They have all become wonderful young men. KEnt, Mom, a law student, his wife and daughter & I walked in the A.L.S. Walkathon in Sept. in honor of Fred & in memory of Kent's uncle, Kent's cousin, and the law students father who passed away this summer from A.L.S. Fred & Tammy were there but couldn't walk because Fred's wheelchair battery wasn't holding a charge very well, but we all enjoyed the beautiful day. We attended the Hudson Reunion in Lindsborg,KS in July. It was especially exciting for me because I got to meet two cousins for the first time. Carol Dauer and I have been corresponding for over twenty yearws and Linda Johannsen and I have been corresponding for a little over two years, but have become great friends. We really didn't get to visit much because there was so much genealogy and picture exchanging going on, but still--I'm so happy I have finally met them. Kent & I also attend the Durkin Reunion in Osage City KS in Sept. It was so nice to see and visit with everyone. We were to attend the Dobbins reunion in Colorado in July, but it was cancelled because of health problems with one of the hosts. The Dobbins Reunion will be held in Topeka next summer, so that will be great for us. We missed the Ravenstien Reunion in Kingman this year, but maybe we can make it next year. My parents, KEnt, & I went to LAwrence to watch grandson Brett bowl in the Pepsi Youth Bowling Tournament and that was fun for all of us. I was on Washburn University's Marine Corps REserves Toys for Tots committee again this year & Washburn staff, faculty, and the Veteran's Legal Assoc. of WU gave 398 toys compared to 354 last year and $455.00 compared to 150.00 last year. I bugged everyone with a lot of emailws. Not everyone on campus knows my face, but they sure know my name! Well, that's about it for this year, except to tell you that we had an early Christmas with Dustin, KAren & the boys. Brett played the piano for us and cody sang songs to me. He can sing "When The Sun Goes Down (we'll be groovin')" just like his brother, but he also sang "Grandma Got Run Over By A Reindeer" and I laughed and laughed. It was so cute and funny. May your Christmas be blessed and happy. May your New Year be bright and prosperous. May peace be just around the corner and PLEASE don't forget to PRAY for our military and their families. God Bless America so that we may always remain free. my sister Lisa rec'd an email Oct. 19 2005 from Judy in Tx. "I have rescued an old cabinent card of an infant named Ralph Osborn. The photo was taken in St Louis by Thomas & Miller Photographers. I believe this photo was taken late 1800s or early 1900s. There is a James Osborn family in 1900 Harrison County MO census that I believe is the correct family for this photo. In 1900 James Osborn is age 25, wife Caroline is age 24, they have a one year old son Ralph Osborn who was born in July 1898. This Ralph Osborn shows on the CA Death Index: DOD 25July1974 in Los Angeles. So, if this if your family and /or you are interested in this wonderful old photo of an infant sitting on a fur rug with a wicker chair in the background, please contact me privately. I do try to recoup my cost for photos I rescue & try to return these old photos to their families. " I emailed Judy. she replied: "Thank you for your inquiry about the Ralph Osborn photo. It is such a nice photo: card is 6x8inches, and the photo, which is firmly attached to the card is 4x5 3/4 inches. It is in excellent condition showing a cute little boy in a rather frilly dress (perhaps a Christening gown) sitting on a fur rug with a wicker chair or something in the background. There is no damage at all to the image and it is not faded. I am sorry but I do not have scanning ability. I could let you have this photo for $10.00 which would include postage. I hunt high and low and for the precious few photographs out there that have identification on them. I would guess the identified ones are between 1-5% of all the photos I see. There are many wonderful old photos, but most have nothing on them to tell who they belong to. Anyway, let me know if you would be interested in rescuing this Ralph Osborn photo. I do think you would be pleased with it. I have only been doing this "photo rescue" thing for about two years, but I find it very rewarding. the next time that a John Bryant of Taunton is mentioned in the records, is on 3June1652 which would make him about age 25 when he was brought before the Plymouth Court for exchanging a musket for a fowling piece with the Indians. A John Bryant Jr was admitted as a freeman at Taunton in 1654 and took the oath of fidelity in 1657. In 1659 he is on a list of those entitled to a division of lands at Taunton. On 25May1680 he is on a list giving the names of property owners of Taunton, which states in part, "John Bryant on the right which was his fathers." In 1684 John made out a will and died in 1693 about age 66. In his will he leaves all to his wife Elizabeth, and a son, John. (now we have another John). No John is listed again until 27Sep1710 when a John BRIANT is married in Taunton to a Abigail Holloway. Therefore, I believe that we can justly say that John Bryant Sr of Taunton, whose origin is not known, lived and died in Taunton, and that his only son, John Jr should not be confused with any of the other Johns is the Plymouth colony at this period of time. To wit, John Sr and his son John Jr of Scituate, nor with John Sr of Plymouth, the son of Stephen Sr of Plymouth, nor with the Lt John of Plympton, who married Abigail, daughter of Stephen Sr.
Lt. John Bryant of Plympton, Ma. 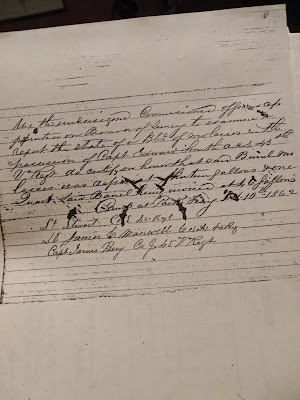 There has been a persistant error by some of the early compilers in trying to identify Lt John Bryant of Plympton, Ma. who married Abigail, daughter of Stephen Bryant Sr of Plymouth, Ma with that of John Bryant Jr. the son of John Sr. of Scituate, Ma. It can now be shown that these two were two distinct persons, and the assumption that they were the same is in error. Lewis Bradford, the town clerk of Plympton, 1812-1851 was partly to blame for this misunderstanding, for it was he who said in some of his notes, that Lt John Bryant of Plympton was the son of John Bryant Jr of Scituate, Ma. This error was taken as fact by those who compiled their genealogies by using the old Plympton records and the works of the early compilers. The use of this error has resulted in descendants of John Sr of Scituate, merging with the descendants of Stephen Sr of Plymouth, and I can find no evidence to show that this ever happened. 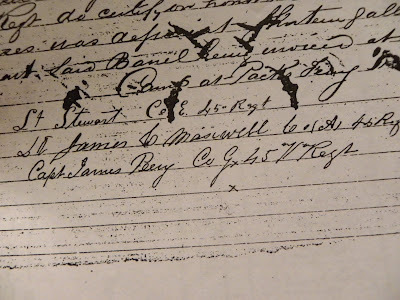 The Scituate town records show that John Jr and Mary (Lewis) did in fact have a son by the name of John. But, this John, according to records, lived in Scituate, married Mary Battellie, raised a family and died there on Jan. 20 1708 never leaving. On the other hand, the Plymouth and Plympton records do not show a John & Mary Battellie, but do show a Lt. John & Abigail Bryant, the daughter of Stephen Bryant Sr of Plymouth as being married and having issue being born there. When one compares the Scituate records with that of the Plymouth and Plympton records, they will find the two Johns both married and having issue being born at about the same time. Lt John & Abigail lived in the western section of Plymouth, which in 1707 became incorporated as Plympton. Not having their own church until 1695, all birth were originally recorded in Plymouth, and later transferred over to Plympton records. To further show that the two John's were not the same, we find in 1718, 10 years after the death of the so-called Lt John of Scituate, a Lt John of Plympton, selling his farm to his youngest son Benjamin, for a promissory note of 400 pounds. The John of Scituate did not have a son by the name of Benjamin. It should be noted that this error was first pointed out in 1881 by William B. Lapham in his article "Lt. John Bryant of Plymouth", then in 1972 by Harold S. Bryant in his article on the poet, William Cullen Bryant, and again in 1983 by Robert C. Bryant in his edition of "John Bryant of Scituate, Massachusetts and his Descendants." Stephen Bryant Sr of Plymouth Ma. Stephen came from England to Plymouth as a young single male. The actual date of when he came to New England, his birth and death dates, or whom his parents were are unknown. Plymouth town records were not kept until 1636. He must have been of age in 1636 for her marked his cattle and registered the mark in the town book at Plymouth. Thus, he had to have been born before 1615. According to Kingman, Stephen was here in 1632, making him about 17+ when he came over. He is on the 1643 list of those able to bear arms at Plymouth and land was purchased by him the same year. 1646 he is on a list of inhabitants at Plymouth. In 1647 he is not on the list at Plymouth, but in Duxbury, married to Abigal Shaw, where she gave birth to their first child, Abigail. In 1654 he is appointed constable of Duxbury and in 1658 he's back at Plymouth, being appointed surveyor of highways. Thus, sometime between 1654 & 1658 he came back to Plymouth. In 1663 he is appointed constable of Plymouth. 1684, Stephen is on a list of soldiers of Plymouth (may be Stephen Jr.) and from that date on, Stephen Sr. is only mentioned in past tense, so he must have died soon after 1684, making him about 70 years old. It has been stated that he was the brother of John Sr. of Scituate. I can not find any evidence that proves they were. Also been stated that John Sr of Taunton was his father, but the date refutes this claim. 20Dec1891 age 24 married Ellen Elizabeth Axsom, daughter of Francis A "Frank" Axsom & Serepta M. Snow in Surry Co NC. she was born 10Dec1871 Surry Co NC, died in YadkinCo NC 19Feb1940 age 68, buried in Harmony Grove Friends Church Cemetery. Betty was born 7Dec1858, died 14Aug1937. she was born & died in Surry Co NC. 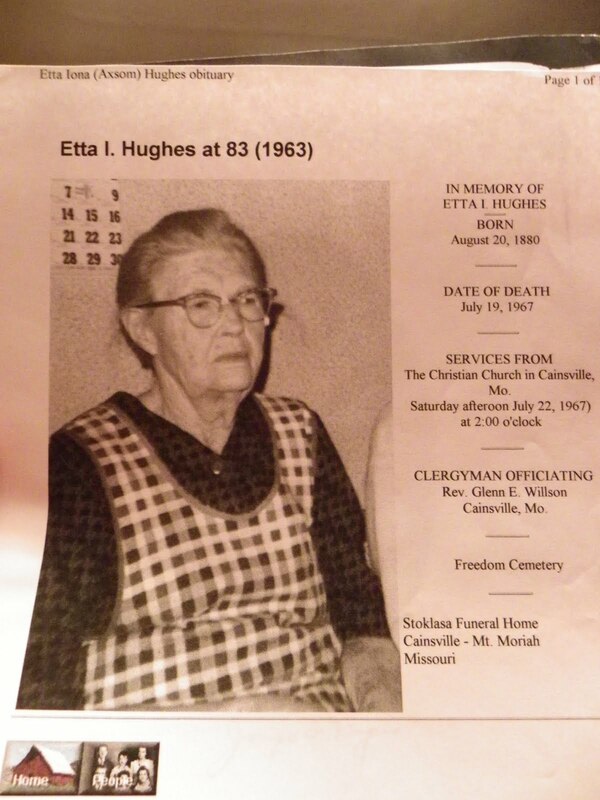 she was buried 15aug1937 in Little Richmond Baptist Church Cemetery. on 13July1880 at age 21 Betty married Samuel Cornelius Axsom, son of Samuel J Axsom & Phoebe Nicholson in Surry CO NC. Samuel born on 1Aug1862, died 15July1938 age 75. he was born & died in Surry Co NC. buried 4Aug1938 in Little Richmond Baptist Church Cemetery. Samuel was a farmer in the Little Richmond community of Surry Co NC. he & Betty were members of the Little Richmond Baptist Church. on the 1900 census they are living in Marsh Twp. household No.6, and she is listed as "Margery" while the name Mary is taken from their joint tombstone. the census also indicates they had 4 children with all 4 children still living. some lists of this couples children shows a son named Andrew but no proof of this has ever been located. 111. Samuel Hasten "Hastie" Wood born 24Sept1881 in Surry Co, NC. died Surry Co. NC 12Nov1929, age 48. Buried in Little Richmond Baptist Church Cemetery. Samuel was a farmer and saw-miller in Marsh Township, Surry Co, NC. 31May1903 when he was 21 he married Dora Idela [sic] AXSOM, daughter of Samuel Cornelius AXSOM (1862-1938) & Mary Elizabeth "Betty" Stanley (1858-1937) in Surry Co, NC. Dora born 7Aug1882 in Surry Co NC, died 19Nov1969 Surry Co NC, age 87. buried in Little Richmond Baptist Church Cemetery. Most people looking at this page may not have much information to provide but every bit helps develop the story line for the book. For example: The 23rds first commander, Colonel Tindall was killed at the Battle of Shiloh. Most of the regiment was captured, sent to a Confederate POW camp at Macon Georgia and later parolled to Benton Barracks, St Louis MO to await exchange. While there, a mutiny occurred by parolled Iowa troops when the 23rds acting commander, Lt. Col Quinn Morton, was provost over paroled troops and tried to put them to work in violation of their parole. Colonel William Robinson was appointed the 23rds Commander for the regiment when exchanged. He was tasked to provide security for the railroad bridges heading to the southwest of St Louis. During his assignment he received a court martial for failure to ensure the execution of an arrest warrant for a run away slave in Franklin County Missouri. William Robinson of Bethany Missouri was mustered and elected Captain of Company "D" September 22 1861. Upon the death of Colonel Tindall at Shiloh, Lt Colonel Quinn Morton assumed command of the 23rd Missouri until June 7 1862 when William Robinson was appointed Colonel and Commander of the 23rd. He served as Commander to September 22 1864 when the majority of the regiment was sent home after the Battle of Atlanta due to the completion of three year enlistments. His prior military service included the summer of 1847 when he enlisted for the Mexican War. He was in Company E, Third Regiment, KEntucky Volunteer Infantry and was elected orderly sergeant. He fought in General Winfield Scott's Mexico City campaign and was discharged in August, 1848. Colonel Robinson was a member of the GAR and was the first Commander of the Lieutenant T.D. Neal Post No. 124 at Bethany, MO. He was a Master Mason, member of the IOOF and a Knight's Templar being a charter member of Bethany Commandry No. 42. I only work on this book part time and appreciate any help provided. I am compiling data on each company and I thank the many people who have contributed. IF you had an ancestor who served in the 23MOV let me know what company he was in. On the master roster page you will find all names compiled so far. 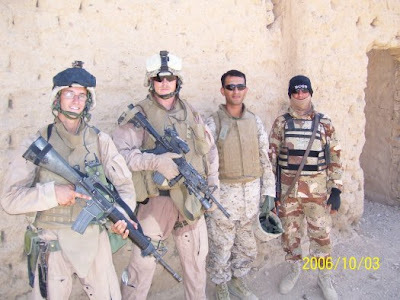 Check there first and then go to the company page to list your veteran. You will also find a link to the Missouri county genealogy homepage where the company was recruited. I update this information as I receive it and I need any information you can provide, personal stories, diaries, letters, photos or additional written information found in history books. There has been a lot of success in locating veteran's descendants. If you provide copies of letters, diaries, photos, etc. you will be credited in the book. E-mail me and let me know what you have. Keep in mind this book is far from publication. for those of you who do not know much about the 23rd Missouri Volunteer Infantry, the 23rd MOV Service History lists all the assignments, movements and battles engaged in from Shiloh to Atlant, and from the MArch to the Sea to the Grand Victory Parade in Washington,DC! Joseph Axsom's first appearance in North Carolina seems to have been in Rowan County in 1809. Joseph was listed on the 1809 Rowan Tax List with 188 acres (a recent find credited to Randall May). The 188 acre plot in Rowan Conty was located in the northern part of Rowan thta then bordered Surry County. 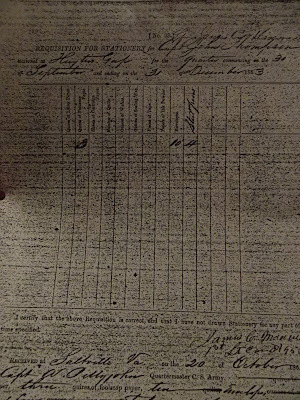 Joseph next appeared on the 1810 Surry County, NC census. In 1812 he was listed on the Surrey County Tax List with 0 acres. Joseph purchased 50 acres of land along Dutchman's Creek in 1813, and another 100 acres along Dutchman's Creek in 1830. Dutchman's Creek is in present day Yadkin and Davie Counties. Joseph's property could have been located along Steelman's Creek. Very little of Dutchman's Creek lies in present-day Yadkin. Steelman's Creek may have been called the north fork of Dutchman's Creek in the early 1800s. The headwaters of both creeks originate in southern Yadkin County. Joseph married Nancy (possibly Nancy May) circa 1803. After Joseph's death in 1833, Nancy was allotted 1/3 of Joseph's land as her dower. It is not known how long Nancy remained on the home place. 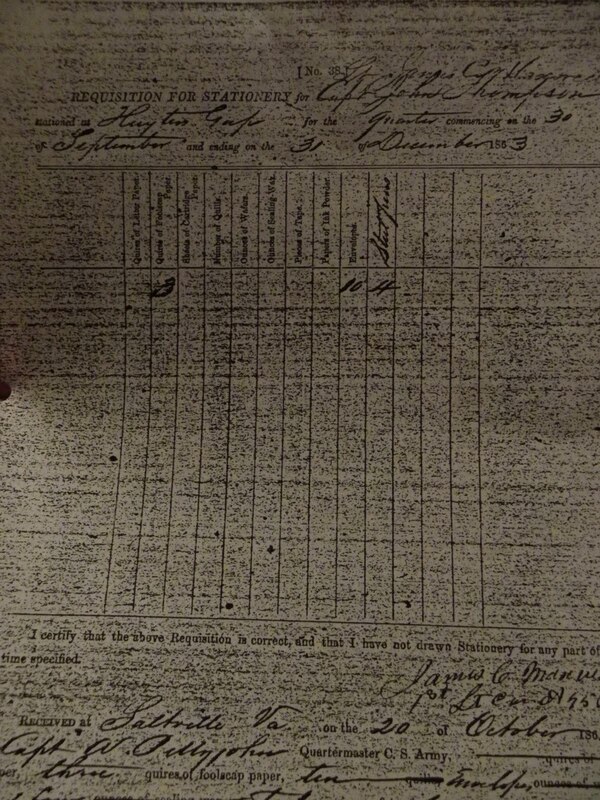 She was listed as living in Marsh Township on the 1850 Surry census. Marsh township is in present-day Surry County. Nancy obviously desired to be closer to her sons, Martin and Joseph. Nancy died on Christmas Eve 1854. She is buried in the Axsom Family Cemetery, which is located on land that was owned by Martin. Joseph's burial place is unknown; however, it is likely in present-day Yadkin County. Joseph and Nancy had ten children: Martin, Samuel David, Andrew, Mary "Polly", Elizabeth, Nelly, Nancy E., Joseph Jr., James, and Alexander. MArtin Axsom married Susannah Lundy on 03May1826. Martin bought 100 acres of land along Pleasant/Pheasant Branch (present day Surry County), in 1832. At the time of his death in 1873, MArtin owned a 200 acrew home tract, 8 town lots in Dobson, and an additional 12 acres. Susannah received 1/3 of all MArtin's property as her dower. The home tract was part of Martin's original purchase in 1826. He acquired an additional 100 acres sometime after the initial purchase. Martin's home tract is now called the Old Lee Cockerham Farm. It is located on Gilliam Road, off State Road 268, in southern Surry County. Susannah lived on the home place until her death in 1879. MArtin and Susannah are buried in the Axsom Family Cemetery. Samuel David Axsom married Winifred Matthews on 16December1828. Samuel David was listed on the Surry county tax list in 1835 as owning 75acres in the Bean Shoal District. Samule David and Winifred moved to Indiana in 1837. A deed registered in Monroe County, Indiana, on 19May1837 recorded the purchase of property by Samuel AXOM from Solomon Fleetwood. Samuel bought additional property in Monroe Co. from William Todd in 1838. 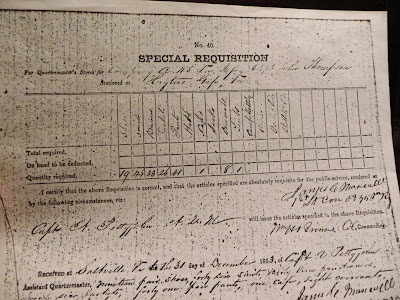 Several Indiana Land Patents were issued to Samuel between the years 1838-1854. All were in Monroe County except one parcel of 40 acres in Lawrence County, Indiana. Samuel may have owned land in Jackson County, Indiana, too. Winifred died sometime between 1850 and 1851. She is buried in Todd Cemetery in Monroe co, Indiana. Samuel David subsequently married Melvina (Hall) Fleetwood. she died 14July1883 and is buried in the Deckhard Cemetery in Monroe County, Indiana. After Melvina's death, Samuel David married Anne (Hedrick) Wilkerson. Samuel David died inDecember 1892. He is buried in the Todd Cemetery in Monroe County, Indiana. Andrew Axsom married Elizabeth Weldon 29June1830. Andrew lived along Harmon's Creek or Deep Creek in present day Yadkin Co. until he bought property in 1855 along Snow Creek in present day Surry Co. Andrew's Surry property is believed to have been located near Dobbins Mill on Snow Creek (Currently, Snow Creek Millery, Dobbins Mill Road). Elizabeth died sometime between 1880 and 1884. Andrew married again at age 75. He and Sarah Linville were married 27April1884. Andrew died July 1889. Andrew & Elizabeth's burial place is not know. SArah remarried after Andrew's death and later moved to Eden, NC. Sarah died 02July1924. She is buried in Overlook Cemetery in Eden. Elizabeth Axsom married Joseph Revis/Reavis. Elizabeth and Joseph lived in Surry Co at the time of the 1840 census. They were listed on the 1850 census for Wilkes Co., NC (adjourns Surry county to the west). 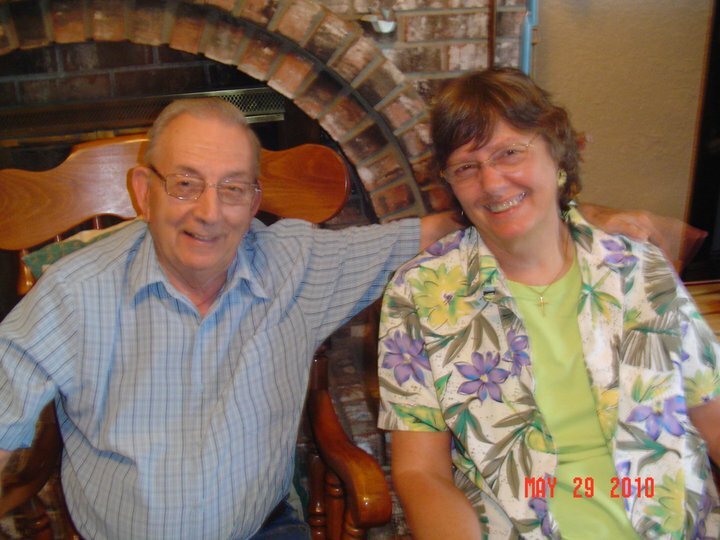 According to an article in The Heritage of Wiles County, 1982 Elizabeth and Joseph lost their home in Surry Co in a fire. Upon being faced with foreclosure on his land by brother-in-law Charles Steelman, Joseph embarked on moving his family to Georgia. Early into the journey, one of the children became seriously ill and the family got no further than Wilkes Co. Joseph & Elizabeth were forced to abandon plans to move to Georgia. Joseph died in 1874 and Elizabeth died in 1894. Both are buried in an abandoned cemetery located on the farm of Odell Wyatt on Boomer Highway, Moravian Falls, Wilkes Co, NC. Mary "Polly" Axsom married Samuel Wilkins about 1832. he bought 150 acres of land from Joseph Steelman in 1839 located on the 'water's of Dutchman's Creek." The property description sounds more like the description of Joseph Axsom's 150 acres located in the same area. Samuel died in late 1852 or early 1853. AFter Samuel's death, his property was sold to Archibald Comer, but Mary retained lifetime rights to her dower of 51 acres. Mary "Polly" remained a widow until her death. Mary's burial place is unknown, but she and Samuel were members of the Courtney Baptist Church in Yadkin Co, NC. It is possible they are buried in the church cemetery in unmarked graves. Nelly Axsom married Anderson McBride about 1831. they were listed on the 1840 Davie County Census. In 1850 they were living in Surry Co. The probably lived along the border of present-day Davie & Yadkin Counties. Nelly died in 1855. She is buried in the Courtney Baptist Church Cemetery in Yadkin Co. Anderson remarried after Nelly's death. He died sometime between 1870 and 1877 in Davie County. Nancy E Axsom married James Sprinkle in 1834. They settled in present-day Surry county somewhere along Mt Herman Church Road. James died in 1885 and Nancy died in 1900. It is speculated by some family members that James & Nancy are buried in the Axsom FAmily Cemetery, but if they are buried there, the graves are unmarked. Joseph Axsom, Jr. married Mary Setliff about 1838. he bought land on the north side of the Yadkin River in 1839. he owned other property in Surry Co, including the Axsom Mill on Snow Creek. Joseph & Mary's home place was located on what is now State Road 268 near the intersection of Joe Layne Mill Road (the same tract of land that was bought in 1839.) The house, which is believed to be the house Joseph & Mary lived in, is still standing. Joseph died in 1888 and Mary died in 1900. Both are buried in the Setliff/Anthony Cemetery located off Joe Layne Mill Road. James Axsom married an unknown Jane. 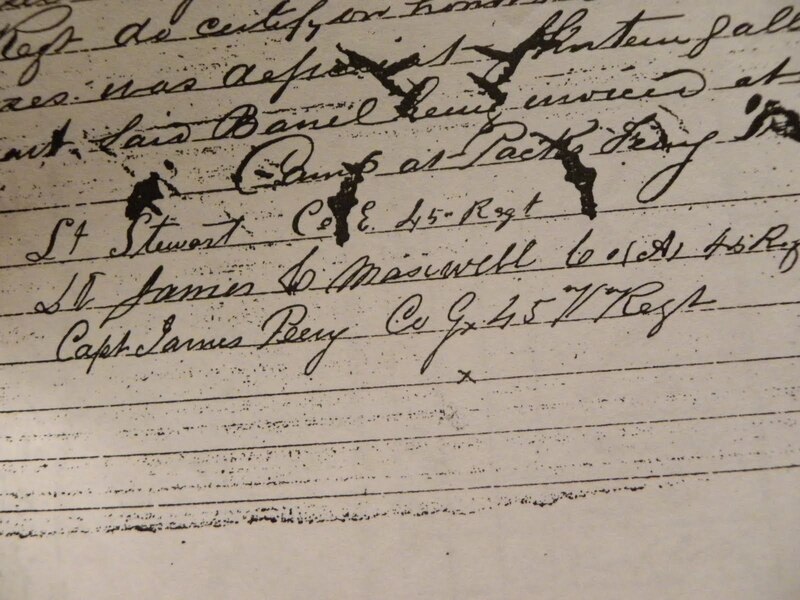 James was found listed on the Panola Co, Mississippi census in 1850. He was found in Desota Co, Mississippi in 1860. According to both census reports, James and his wife, Jane were born in NC. James was a blacksmith. James moved to Tennessee sometime after 1860. The exact location is unknown. Alexander Axsom married an unknown Mary. Although there is no proof, Alexander is thought to have been the same Alexander AXUM/Axsom who was listed on the 1850 and 1860 Mecklenburg county, NC census. The Alexander in Mecklenburg County would have been about the same age as Alexander Axsom born in Surry Co. There was also an Alexander AXIOM from Mecklenburg Co in the Civil War who was captured on 02April1865 and confined at HArt's Island New York Harbor on 07April1865. Alexander has not ben located on any census reports after 1860, however, it is assumed that Alexander was still living at the time of his brother Martin's death in 1873; Alexander Axsom is listed among those owing debts to the estate of Martin Axsom. The following article was written for the Bethany Republican-Clipper, by Phil Steward, wtih whose permission it is used. A noted historian once said that "When history is lost it becomes legend, and when legends are lost they are lost forever." Such is the case with many of our founding fathers and much of our local history. People, places, and events fade from our memories with the passage of time and through the so-called "progress" of our modern society. One such figure is William Perrine Robinson, who quite possible did as much as any man in the formation and development of Harrison County during the last half of the nineteenth century. He was a farmer, a soldier in two wars, an elected county official, the first editor of the Bethany Republican newspaper and, through the passage of time, an almost forgotten man. As was the case with most early residents of Harrison county, William Robinson was not born in Missouri. The lands of western Missouri, including what is now Harrison County, were wild and predominantly unsettled at the time of his birth in 1826, but the area would soon witness a flood of immigration and growth as settlers came west in search of land and opportunities. Among these pioneers was William Robinson, who came to Harrison county with his new bride in 1854 and purchased a farm in Colfax township near the Iowa state line. Although he was just 26 years old, Robinson quickly established himeself as an honest, capable and likable young man who was college educated and had served as an Orderly Sergeant in the Mexican War under General Winfield Scott. The peace and prosperity of the 1850's would soon give way to the horrors of the Civil War. Although he had been born in Kentucky of southern parentage, William Robinson was a strong and outspoken supporter of the Union and was among the first of Harrison county's young men to join the federal forces. Company D of the 23rd Missouri Volunteer Infantry was being formed in Harrison County in the summer of 1861 and as was the practice at the time, Robinson was elected Captain by the men of the company. The unit was formally mustered into the 23rd MO on September 22 1861. The unit's first battle came on April 6 1862 near a crossing on the Tennessee River called Pittsburg Landing. History would refer to it as the Battle of Shiloh. The 23rd, along with Company D of Harrison County, was assigned to a Division under the command of General Benjamin Prentiss. Prentiss would become known as "The Hero of the Hornets Nest" for his actions during the battle and would later become a distinguished resident of Bethany. But on April 6 1862 being a hero was the last thing on the minds of General Prentiss and the men of Company D. For these men, the main goal was survival, and many would lose their lives. Cut off from the main army and surrounded by their enemy, the entire regiment of the 23rd Missouri was forced to surrender to Confederate forces. Although wounded in battle, Capt. Robinson survived, and along with his men, was transported to a Confederate prison near Atlanta until they were formally exchanged a few months later. Upon his return to duty, Robinson was promoted to Colonel and given command of the entire regiment, replacing Colonel Tindall who had been killed during the battle. Colonel Robinson continued to serve as commander of the 23rd until the unit was mustered out of the service on September 22 1864. William Robinson returned to Harrison County nothing less than a hero to its residents. Most of the local men who had served during the war had been under his command. He had been their leader in battle and their friend in peace. Few ties are stronger than among men, and Robinson was quickly elevated to a position of prominence within the community. In 1867, Robinson and a small group of investors founded the Harrison county Press and began publishing the Bethany Republican newspaper, the grandfather of today's Republican-Clipper. After six months as its editor, Robinson sold his interests and entered politics. He served as the deputy county clerk from 1867 to 1872 when he was elected Probate Judge, a position he held until 1878. After resigning from the legal bench, Colonel Robinson served as county clerk until resigning from political lie in 1892. Two years later, at the request of the editor, Robinson returned to the Bethany Republican newspaper as a writer and associate editor. His failing health forced him to leave the paper in 1899. Colonel William P. Robinson died at Manhatten Kansas in June, 1904. His body was returned to his old home at Bethany where he was laid to rest in Miriam Cemetery with full military honors. His old newspaper stated that "All business was suspended in the city from 2 o'clock until the conclusion of the service..." Such high regard was given to the fallen colonel that the Post Office Department in Washington DC was contacted and gave permission to close the local facility and to fly the flag at half-staff. This act was "an act of courtesty on the part of the government, recognizing the worth of Colonel Robinson, both as an officer and a man." The paper reported that permission to close the post office was "the first instance in our city." Colonel Robinson now lies near a small grove of trees along the ridge in Miriam Cemetery. There are no glowing tributes engraved on his stone. No accounts of the many battles or the years of public service. He simply lies beneath a modest stone, next to his beloved wife. A short distance to the south rests General Benjamin Prentiss, "Hero of the Hornets Nest", complete with epitaph and military service stone. One is forever enshrined in the history books of the Civil War, whle one has been all but forgotten. Almost. In the spring of 1856 William Perrine Robinson came to Harrison County, Missouri, and followed the business of farming in school teaching in Cofax and Hamilton townships (then Marion township) until the breaking out of war in 1861. At this period, after the flag of our country had been fired upon at Fort Sumter, loyalty and disloyalty were the all-absorbing themes of the people's attention and conversation, and excitement ran riot throughout the length and breadth of our land. The subject of this sketch boldy and zealously espoused the cause of the old flag, under which he had fought in Mexico, and with other loyal friends of the Union in the county, united in devoting their whole time and energy toward unifying the loyal sentiment and bringing it to active operation. In furtherance of this object, in July, 1861, he, with about 50 or 60 other young and middle-aged men, enlisted in a company at Eagleville, which had been partially raised at Cainsville by John A. Fisher, and with this addition was now full. This company was being raised for a regiment of infantry to be commanded by Col. Jacob T. Tindall of Trenton, Mo. Upon organization of this company, William P. Robinson was elected captain, and upon the organization of the regiment this Company became Company D, 23rd Regiment, Missouri Volunteer Infantry. He then removed his family to Sangamon County, Ill. He remained in command of Company D until wounded at the Battle of Shiloh, on the 6th of April 1862, and as soon as his wound permitted him to return to the regiment, about the first of the following June, he was commissioned colonel of this regiment, to fill the vacancy caused by the death of Col. Tindall who was killed in that battle, and as such did faithful and gallant service until mustered out with his regiment at Atlanta, Ga., on the 22nd day of September, 1864. In the spring of 1867 Col. Robinson returned with his family from Illinois to Harrison county, Missouri and taking up his residence at Bethany conducted the Harrison County Press, a weekly newspaper, for about six months, when he abandoned the newspaper business, and served as deputy county clerk until 1872, when he was elected probate judge. After filling that office for one term of four years, he was re-elected for a second term, but resigned in 1878 and became a candidate for county clerk, in which he served continuously be re-election in 1882 and 1887 respectively. In politics he was an old line Whig from the time he was old enough to vote and at the election in 1860 cast his vote for Bell and Everett, since which time he had been staunch and unswerving Republican, and had taken an active part in all political campaigns in the county. Republican. His ability as a writer and earnest efforts in his labors, commanded the confidence fo teh patrons of the paper and the Republican prospered under his work. But on account of his health he resigned as editor in January 1899. During these years he also served as public administrator of this county. Lucinda wife of Frank Simmons, of Springfield, Ill.
Clifford the youngest who is about 14 years of age, and lives with his mother at Manhattan. Col. Robinson was a member of the GAR, and was the first Commander of Lt. T. D. Neal Post No. 124 at Bethany. He was also a member of the IOOF and a Knight Templar, and one of the charter members of Bethany Commandery. No. 42. He was a member of the Christian Church and an earnest worker in the promotion of the cause of temperance and morality. upon his fathers second marriage, William P was taken home where he remained until the death of his stepmother which occurred about 1835, when, his father again breaking up housekeeping, he was returned to the home of his uncle, where he remained, occassionly attending school in the primitive log school house of the day, until his 12th year. He was sent by his father to Wabash College, Indiana, with the intention of giving him a thorough collegiate education, but owing to unsuccessful business speculations was compelled, at the end of about two years, to take the boy home again to learn the tanners trade. Soon after attaining his majority, in the summer of 1847 he enlisted for the Mexican War for a term of three years or during the war in a company of volunteers which was then being raised in his native town. This company, upon the organization of the regiment, became Company E, Third Regiment, Kentucky Volunteer Infantry, of which the subject of this sketch was elected orderly sergeant. After a hard campaign of nearly one year, the regiment then being with Gen. Scott's army at the City of Mexico, peace was declared between the two nations, and the troops returned home, arriving there about the last of August, 1848. On the 31st of the same month, he was married, and a short time thereafter his father retiring form business, William P. succeded him, and carried on at the same until the fall of 1854, at which time he, with his family, immigrated to Iowa, and located upon a farm in Washington Co. Then in the spring of 1856 William Perrine Robinson came to Harrison County. Capt James Peery Co G 45 Va Regt. Clergyman officiating Rev. Glenn E. Wilson, Cainsville, Mo. Stoklasa Funeral Home Cainsville-Mt. Moriah Missouri. in this photo Etta is age 83. the year is 1963. 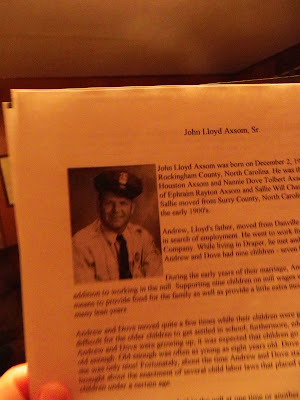 John Lloyd Axsom was born on December 2 1919 in Draper, Rockingham County, North Carolina. He was the third child of Andrew Houston Axsom and Nannie Dove Tolbert Axsom. He was the grandson of Ephraim Rayton Axsom and Sallie Will Chaney Axsom. Ephraim and Sallie moved from Surrey County, NC to Danville, VA in the early 1900s. Andrew, Lloyds father, moved from Danville to Draper, NC in search of employment. He went to work for Marshall Field and Company. while living in Draper, he met and married Dove Tolbert. Andrew and Dove had nine children-seven boys and two girls. During the early years of their marriage, Andrew always farmed in addition to working in the mill. Supporting nine children on mill wages was difficult. Farming was a means to provide food for the family as well as provide a little extra income, still, the family suffered many lean years. Andrew and Dove moved quite a few times while their children were growing up. That made it difficult for the older children to get settled in school; furthermore, education was not stressed. When Andrew and Dove were growing up, it was expected that children go to work as soon as they were old enough. Old enough was often as young as eight years old. Dove was working in the mill when she was only nine! Fortunately, about the time Andrew and Dove started their family, social reform brought an enactment of several child labor laws that placed restrictions on the employment of children under a certain age. Most of the Axsom boys worked in the mill at one time or another, but they were an industrious lot and soon developed skills that allowed them to pursue other avenues. Lloyd went to work in the mill when he was sixteen. Lloyd met Mildred Thompson, a native of Patrick County, VA when he was eighteen and she was seventeen. At the time, Mildred was dating Lloyd's friend and first cousin, Mouar Wilson. Lloyd quickly stole her away. Mouar pouted for awhile, but he and Lloyd soon became best friends again. Lloyd and Mildred were married in Draper on January 28 1939 at the home of Lloyd's uncle, Andrew J. (Jack) Talbot. Their first child, John Lloyd Axsom, Jr. (J.L.) was born on November 26 1940. Soon after, Mildred contracted tuberculosis and spent 16 months in a sanatorium. While Mildred was in the sanatorium, her mother and dad, who still lived in the mountains of Virginia, kept the baby. Lloyd would make the long trek up "Lovers Leap Mountain" in a Model A Ford to visit J.L. On one trip he was accompanied by his uncle, Turner Jarrell. On the way up and down the mountain they had somewhere between 16 and 21 flat tires-depending on who is telling the story. They made the last leg of the journey riding in on the rim. Mildred recovered from her bout with tuberculosis and was reunited with her family. A second child, Norma Jeanne, was born on February 19 1946. Over the years, Lloyd held various jobs, but he seemed to find his niche in law enforcement. He had a geniune love for people and had a reputation of being honest and just. He went to work for Rockingham County as a deputy sheriff in 1952. The next year, he was appointed Chief of Police of Spray, NC. He served in that position from 1953 to 1959 and returned to the Sheriff's Dept. in late 1959 or early 1960. HE resigned the Sheriff's Dept in the fall of 1963 and opened a small restaurant in Spray, NC. He also owned and managed three laundromats over a period of about ten years. Lloyd was a handsome man. He was 5'11' and weighed about 220 pounds. He had dark hair, gray eyes, a distinctive cleft chin, and a winning smile. He was meticulous about his dress adn looked especially handsome in his uniform. Lloyd was also a talent musician. He began playing a guitar at an early age and sang in a clear baritone voice. In the 1940's, he and several friends formed a bluegrass band called The Dixie Mountaineers, and played at various social functions. The band could also be heard on the local radio station every Saturday afternoon. Lloyd's voice was preserved as a result of old records cut during that time. On January 16 1964 Lloyd died of complications resulting from gall-bladder surgery. He was 44 years old. His untimely death was a terrible shock to his family and friends and was followed by a tremendous outpouring of love and support from all segments of the community. Lloyd is buried in the Dan View Cemetery in Eden, NC. His son and daughter maintained their residences in Eden. Note: The towns of Leaksville, Spray, and Draper consolidated in 1967 to form the City of Eden. 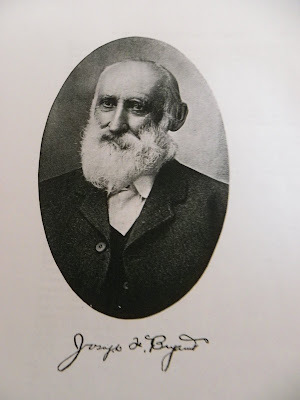 One of the veteran members of the Northwest Missouri bar is Judge Joseph Francis Bryant of Bethany, who has lived in Harrison County more than sixty years, was admitted to the bar soon after the beginning of the Civil War, and in connection with private practice and varied business affairs has given service in judicial offices. Judge Bryant during his long career in Bethany has been identified with many phases of the community's growth. Many houses and business buildings have been erected through his instrumentality, and at the same time he has practiced law, has been a merchant, and always more or less identified with farming. He has also been an aid to the promotion of banks, both in his home town and elsewhere, and his dealings in real estate have been a large source of his material prosperity. Joseph Francis Bryant was born January 21 1841 in Bartholomew County, Indiana. He comes of old American stock and his family was distinguished both in Virginia and Kentucky. Tracing the ancestry back as far as possible, we come to John Bryant, great-grandfather of Judge Bryant. John Bryant was a Virginian who was born in Cumberland County, January 1 1760 and died in Garrard County, Kentucky, in 1833. He first enlisted for service in May 1780, being at that time a resident of Powhatan County, and gave fifteen months of service as private and sergeant under Captains Hughes and Porter and Colonels Nelson Randolph and Good. The principal battle in which he was engaged was the battle of Guilford Courthouse. In that same engagement were his father, James Bryant, Jr., his brother William G. Bryant, and his uncle Thomas Bryant, who was a lieutenant and was killed, while another uncle, Isaac Bryant, was wounded in the head. John Bryant recieved a pension from the United States Government for his Revolutionary services in August 1833. He married Mary Ousley, an aunt of Governor Ousley of Kentucky. In 1783 John Bryant came out to Kentucky and was a civil engineer with an appointment signed by Patrick Henry, secretary of state for Virginia. He was commisioned by General Washington to survey Kentucky, and was an associate of Daniel Boone, the first white man to set foor on Kentucky soil. James Bryant, grandfather of Judge Bryant, was born in Garrard County, Kentucky and died in that county. His children were John, James G., William, Moses, George, Simeon, Benjamin, Archibald, Isaac, Joseph, and Louise, who married Allen Matthews. Judge Bryant's father was Stephen Bryant, who was born in Garrard County, Kentucky October 1 1811 and married Elizabeth Hancock, who was born in Mercer county, Kentucky about 1820. Their children were Judge Joseph F.; Jane, who married John Endlsey of Harrison County; Mary, who married Columbus Thomas F. Walton of Harrison County; William Scott, who died in Oklahoma; and Martin L., who died in Harrison County, leaving two children. Joseph Francis Bryant was about ten years of age when his parents came to Missouri and located four miles east of Bethany in Harrison County. He had been educated back in Indiana in private schools, and after coming to Missouri attended the college at Trenton for a short time. Reared on a farm, he taught school the winter he was seventeen, and after teaching began work at Bethany as deputy in the county circuit clerk's office, and in the meantime studied law privately. Judge Bryant was admitted to the bar in 1862. During the war between the states, he joined the State Militia, but poor health caused his discharge. Politically he has always been a republican, adn was a delegate to the state convention which nominated Fletcher for governor in 1864. His county claimed his services for a number of years, and in 1862 he was appointed school commissioner, and in 1864 elected county attorney, an office to which he gave four years. In 1870 came his election to the office of presiding judge of the county court, where he served five years, and in 1878 he was elected probate judge of the county. Judge Bryant has been a member of the Christian Church since 1868, and has been affliated with the Masonic Order for more than half a century. Judge Bryant's first wife was Miss Rhoda Manus. She died in 1877, leaving the following children: John and Ora, both of Bethany; Cora, wife of T.D. Neal of same city. On August 7 1879 Judge Bryant married Annie Robinson, a daughter of Colonel W.P. and Rachel (Sims) Robinson. Colonel Robinson, who died in Bethany, came from Kentucky. Besides Mrs Bryant the other children in the Robinson family were Mrs Fannie Grenawlat, who spent her life in Harrison county; Mary, wife of Charles Barber of Manhattan, Kansas; Lute, wife of Frank Simmons, of Springfield, Illinois; George Robinson, of Stocks, Canada; Lizzie, wife of George Williams of McPhearson, Kansas; and William, of Kingman, Kansas. Judge and Mrs Bryant have the following children: Pauline, of Alton, Kansas, wife of T.N. Martin; Elizabeth, wife of George Reid, of Globe, Arizona; Joseph F. , Jr. of Bethany; William, who lives in Bethany and married May Linville; Elsie Louise, at home; George W.; Bertram; and Howell, who are still in school. 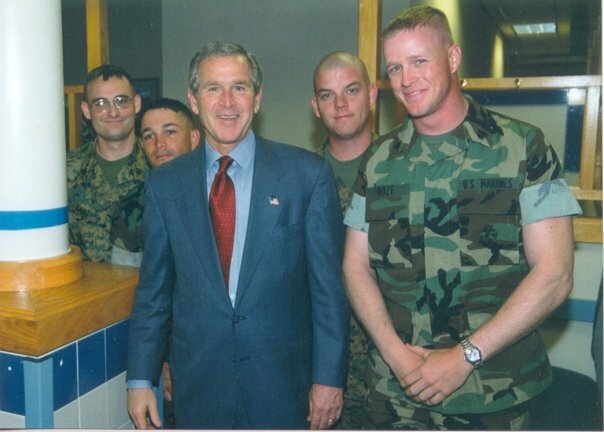 Jesse was very badly injured in Iraq ... here are pictures from his moms face book of Jesse in Iraq, with his son Curtis, and on his 25th birthday with George Bush! my great great grandpa JC Maxwell fought on the Confederate side in the Civil war. on these forms he is listed as 1 Lt. Co A 45 Regt. Va.
July 1862 present for duty neaer Union Va. Inspection Report "of Forsberg's Brigade, Wharton's Divison, commanded by Major PEter Otey, 30th Batt'n Virginia Sharp Shooters." Dec 29 18645 camp near Augusta Co Va.
Oath of Allegiance to the United States subscribed to at Fort Delaware, Del. One of the younger men of Harrison County who have shown successful ability in business affairs and have also made themselves useful in a public way is John Brown Bryant, a son of Joseph F. Bryant, a prominent Northwest Missourian whose career is sketched at length on other pages of this work. John Brown Bryant was born in Bethany August 20 1870 and has spent most of his life either in the town or close vicinity. His education came from the city schools, supplemented by attendance at Woodland College in Independence, Missouri and a commercial course in the old Stanberry Normal. His practical business career began at the age of twenty in the Cottonwood Valley National Bank at Marion, Kansas, where he remained two years. He then returned to Harrison County to take up farming, and it was as a substantial farmer that he was known in this community for fifteen years. While on the farm, in 1904, he was elected a member of the county court from the south district as successor to Judge Taggart, and was re-elected in 1906. Judge Miller was presiding judge and his associates in the administration of county affairs were Judges Alley and Tucker. During those four years the board busied itself besides the routine affairs with repairing bridges of the county destroyed or damaged in the noteable flood of that time. They also improved the county farm, adding more land and constructing a substantial barn. Mr. Bryant's successor on the county board was Olin Kies. Besides his work as a county official Mr. Bryant also was a member of the Bethany school board a number of years. Having given up farming in the meantime and moved into Bethany, Mr. Bryant became interested in merchandising as a grocer three years, and then became a partner in the firm of Walker, Bryant, & Company until they soldout to Chambers & Davis. Since then his business has been real estate and insurance, and he is also secretary and director of the Bethany Savings Bank. Since leaving the county board he has taken only a nominal interest in politics, but still classifies as a republican, the political faith in which he was reared. His fraternities are the Masonic, Independent Order of Odd Fellows and the Knights of Pythias. In Harrison County on December 23 1891, Mr Bryant married Miss Carrie E. Howell. Her father was the late Judge John C. Howell, who died while on the circuit bench including Harrison County. Judge Howell was born in Morgan County, Illinois, August 18 1833 and died at Bethany September 29 1882 and had been identified with Northwest Missouri since childhood and for many years was a notable figure in law and politics. His father was a Kentuckian, but settled in Illinois, and on moving to Missouri first lived in Clinton County, but in 1847 went to Gentry County, where Judge Howell grew up. He completed his education at old Bethany College in what is now West Virginia, an institution founded by Alexander Campbell. After entering law, he found himself rapidly promoted in favor and success, and as a democrat was elected to the circuit bench before the formation of the district in which Harrison county is now included. He was a Mason and a member of the Christian Church. Mrs. Bryant is the only child of Judge Howell's marriage to Belle Brown, who was born near Monroe, Wisconsin, and died at Bethany. Mr and Mrs Bryant have two children; Marie, who graduated from Bethany High School in 1913; and Helen, now in one of the grades of the Bethany Public Schools. Alexander Craig was born on December 16 1843, was the seventh child of Andrew & Mary (Heston) Craig. Andrew & Mary Craig came from Indiana in 1859, they made a 32 day trip with oxen & wagon to Mercer county, Missouri. Alexander was married to Christiana Addison on April 22 1866 & enlisted on the 13th of August 1862 as a Private in Co. F. or Iowa's 23rd Infantry. He served until June 2 1865. Doris LaVaughn born 1909 married L.L. Melton, Sr.; Shellie Preston; Jack Hattin; Robert Brookshire. Fred Ramey, born in 1886 and married to Miriam Nelles, was raised with this family, being Elizabeth Maxwell Ramsey's son from a previous marriage. Captain: Agreeable to orders received from Colonel Walker, commanding the brigade, I have the honor to report the movements of the Twenty-third Missouri Infantry Volunteers since joining the brigade. I reported with seven companies of my regiment (three companies having been left at McMinnville, Tenn., to garrison that post) to Brigadier-General Turchin, commanding First Brigade, Third Division, Fourteenth Army Corps, near Vining's Station, Ga., on the 10th day of July 1864, and encamped on the north side of the Chattahoochee River. On the 17th we moved with the brigade across the river without opposition. On the 19th crossed Peach Tree Creek under heavy fire from rebel skirmishers and threw up earthworks. On the 20th moved forward again to obtain a more suitable position on the right of the brigade. On the 26th three companies of my regiment arrived from McMinnville Tenn. On the 28th were ordered to advance the skirmish lines, which was done under heavy, engaging fire. On the 7th of August Companies D and a E and a portion of F, on the skirmish line, were ordered to advance. A severe engagement ensued with the enemies skirmishers, driving them to their main works, but (we) were forced to retire. During the night the regiment advanced and threw up a line of works. On the 12th we were relieved from the front line of works and placed in reserve. Have remained in camp with the exception of the 19th and 20th, when we were out on reconnaissance with the brigade. [nominal list of casualties accompanying report shows 1 officer and 2 men killed and 25 wounded. On the sixth of August the regiment remained in camp northwest of Atlanta in the second line of works, the Seventh Ohio Veteran Volunteer Infantry occupying the first line in our immediate front. August 7, advanced my line about 150 yards in front of the Seventeenth Ohio and built breast-works, my skirmishers meeting with obstinate resistance by the enemy's pickets, who finally unwillingly withdrew to their first line of rifle-pits. August 8,9, and 10, remained in camp; skirmish firing almost constantly, with occasional shelling. August 11, our lines being extended to the right, my regiment was placed in reserve in the second line of the works. August 27, nothing worthy of notice has occurred with the regiment from the 11th instant until to-day; it moved with the brigade about four miles to the right. August 28, marched about three adn a half miles southeast toward Montgomery Railroad, crossing the same about four miles below East Point. August 29, remained in camp. August 30, marched about eight miles southeast and built breast-works. August 31, marched about three-quarters of a mile and threw up works. In the evening of the same day advanced about two miles and again built breast-works. September 1, marched southeast about six miles, when the regiment was formed in the second line of battle, the Seventeenth Ohio on the right. A portion of the Third Brigade, Third Division, being in the first line were hotly engaged with the enemy in our immediate front, but having succeeded in taking the enemy's works by assault, capturing and dispersing the enemy, this regiment took no part in the battle. September 2, marched southeast about one and a half miles, crossing the Macon railroad near Jonesborough. September 6, remained in camp until to-day, when the regiment marched with the brigade on the Atlanta road about two miles, and was placed in the rear as a part of the skirmish line. September 7, marched about seven miles to our present position, one and a half miles southeast of Atlanta. I am proud to be able to state that the officers and men of this regiment, without a single exception, have borne the hardships adn fatigues of the campaign without a murmur, never shunning danger when their duty called, but always manifesting a willingness truly commendable to do there duty wherever placed. More than 250 men of this regiment having served over three years from date of enlistment, fears were expressed that they would not willingly join in the charge upon the enemy, as their term of service had already expired, but all doubts on this point were dispelled in the affair of the 1st instant, as at one time it was supposed our line would have to move up to the support of the troops engaged with the enemy in our front, and when the command to advance was given, they marched forward with an unwavering firmness and determination only known to brave men. Colonel, Cmdg. Twenty-third Missouri Infty. Vols. ancestry.com-Did Our Ancestors Really Care? Family historians frequently 'fuss' over the details in our ancestors' lives. Misspelled names, varying middle initials, birthplaces all over the map, and birth dates all over the calander-all result in much frustration. A great deal of time is spent trying to either integrate inconsistent details or to determine which pieces of information are incorrect and can be ignored. Our ancestors most likely cared less about the differing details than we do. I recently re-read the preface to a 1983 history of one of my own families. The surname was originally Janssen, which frequently was Anglicized to Johnson. The author quipped that when her husband was called to dinner he didn't much care whether it was Janssen or Johnson. The end result was still the same and dinner was still ready. Of course Anglicization and 'age shaving' can complicate the life of the genealogist, creating inconsistencies where perhaps none really exist. THe difficulty is that we can't travel back in time to actually see the John Johnson who married in 1883. Perhaps he really was our Jans Janssen, who for a time Anglicized his name. If I could just see the John Johnson of 1883, I might easily see that he's not the same guy that appears in the wedding portrait dated 1883 I have of my Jans Janssen. That ancestor whose age in the census appears a few years off may still be ours, despite the apparent difference. This is not meant to say that we should leap to conclusions without any evidence or support at all. Conclusion jumping can bring about the most insurmountable brick walls. However, we must realize that in some cases concrete proof will never exist. Few of our ancestors were concerned with leaving behind a record of their existance for the grandchildren and great grandchildren. They were more likely concerned with the immediate needs of the time, preparing food for winter consumption, saving money to buy a small farm, hoping "Pa" would shoot a deer so there would be meat on the table. Immediate concerns of food and shelter had to be addressed, grandchildren and great grandchildren would have to fend for themselves. And if there was the time or tendency for contemplation, there likely was not the money to spend on such frivolities as a diary and a pen and ink with which to record the individual's thoughts. So we are left with what records others created of our ancestors. Brief snapshots at specific moments in time, frequently rites of passage, birth, marriage, and death. Frequently other records are directly or indirectly associated with such an event. A will may be recorded after the death of a parent. A farm may be sold and a deed drawn up upon the death of a surviving parent. A parent may transfer land to a son upon the son's marriage. These records are not vital records, but frequently 'vital' events cause records other than 'vital records' to be created. While we use a variety of records for genealogical purposes, it is important to remember that these records were not created for our own use today, but for a specific purpose at the time of the record. Today when I fill out an application, form, or data sheet, at the doctors' office, insurance company, etc. I pay careful attention to the spelling of my name. I do not want to be inadvertently confused with a Michael Neal or a Michael O'Neill. Once errors get into modern databases they can be extremely difficult to remove. We may also be concerned about someone thousands of miles away 'assuming' our identity and creating even more hassles for us. Great great grandpa likely had no such concerns. I started my job without showing proof of citizenship, but if I wanted to be paid I had to provide a copy of my birth certificate. Chances are when my Irish immigrant ancestor Samuel Neill worked for the railroad in the late 1880s, he simply showed up. He was not concerned with making certain his deductions were done correctly, that his earnings were being tied to the correct social security number, and that as time went on his employer credited him with the appropriate number of years in service towards his pension. If his employer wrote down Samuel's name in a ledger, neither of them probably cared if it was spelled "Neill" or "Neal". And his employer was not likely to let Samuel have a look at his records or files. Even if he had, most of his employees were likely illiterate and could not have read the information anyway. Some of us take pride in our surname and the way it is spelled. It is important to remember that before a significant proportion of the population was literate, name spelling was not nearly as important and that the importance of name spelling has increased over the years as our name ties us to more and more records in more and more computer databases. My great grandparents are listed as "O'Neil" in an early 1900 mortage. 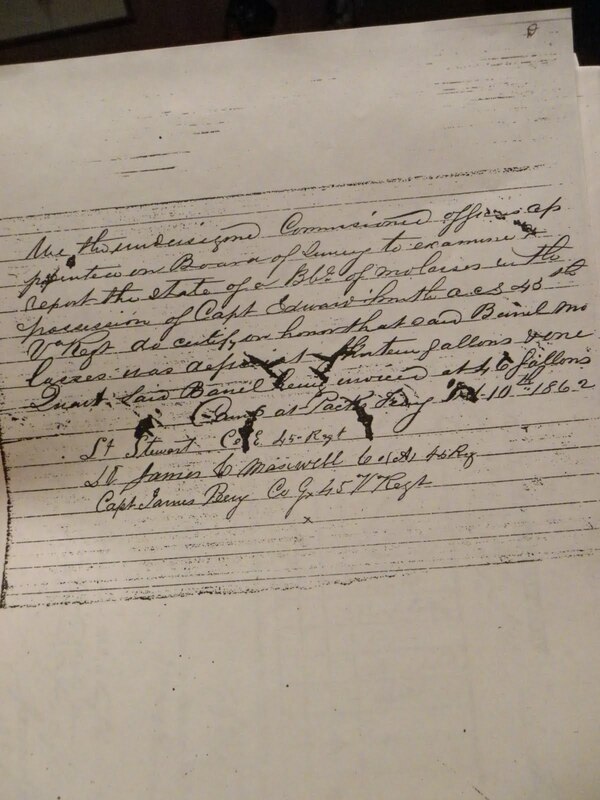 The courthouse copy is a transcription and it also indicates that they signed their name as "O'Neil." This causes me to think something is amiss as their 1903 marriage license, which they also signed, shows their signatures as "Neill." The marriage license contains their actual signatures, not a transcription. Chances are the clerk transcribing mortage records thought the name should be "O'Neil" and entered it that way everytime. 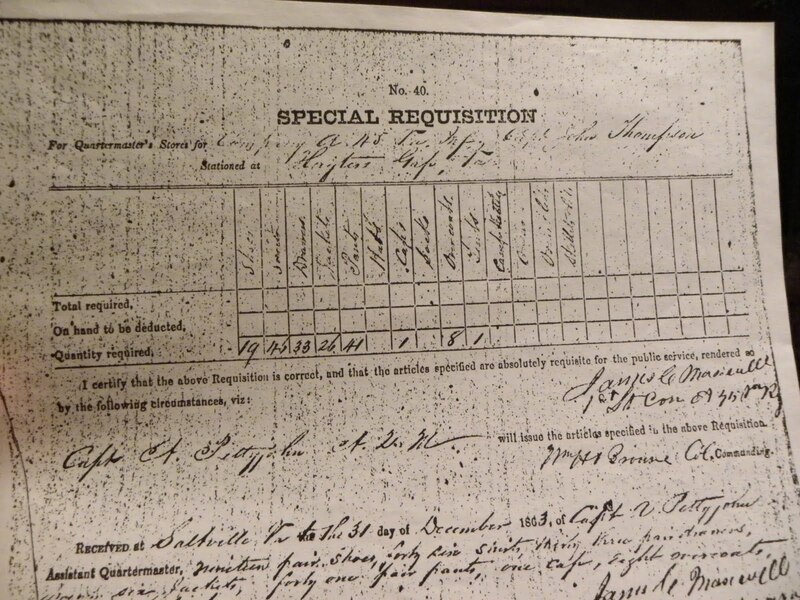 We rely heavily on details our ancestors provided through record keepers, census takers, and other officials. Information supposedly provided by our ancestors, especially on the census. Is there a chance that another household member besides the father or mother gave the information? If the head of the household gave the information, is it entirely correct? Might our ancestor have 'fudged' or told a 'fib' either to get the requestor to leave or to prevent other hassles? The world is significantly different today than it was when our ancestors lived one hundred or two hundred years ago. It is important to remember that at the start of the twenty-first century, we may focus on different details than our ancestors did. mustered and elected Captain of Company "D" September 22 1861. Upon the death of Colonel Tindall at Shiloh, Lt Colonel Quinn Morton assumed command of the 23rd Missouri until June 7 1862 when William Robinson was appointed Colonel and Commander of the 23rd. He served as Commander to September 22 1864 when the majority of the regiment was sent home after the Battle of Atlanta due to the completion of three year enlistments. His prior military service included the summer of 1847 when he enlisted for the Mexican War. He was in Company E, Third Regiment, Kentucky Volunteer Infantry and was elected orderly sergeant. He fought in General Winfield Scott's Mexico City campaign and was discharged in August, 1848. Colonel Robinson was a member of the GAR, and was the first Commander of the Lieutenant T.D.Neal Post No. 124 at Bethany Missouri. He was a Master Mason, member of the IOOF and a Knight's Templar being a charter member of Bethany Commandery No. 42. Etta Iona Axsom was born the third of five children on August 20 1880 possibly in Johnson township, Brown Co, Indiana, or Monroe County, Indiana. At some point her family moved to the southern Iowa/northern Missouri area, where she married John Wesley Hughes on December 21 1899. 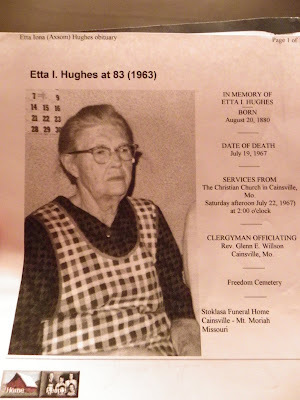 Etta died on July 19 1967. She was the mother of two children. Etta and John are buried together in Freedom Cemetery near Saline, Missouri. She did not want to be buried on the Hughes Cemetery, located on John's father's farm, as she did feel it would be maintained. SIR: I have the honor herewith to acknowledge receipt of telegram from Nashville, May 29 1864 by special messenger from Murfrees-borough, Tenn., and I have accordingly ordered three companies of my regiment, F, I, and K, numbering in the aggregate 200 men, to remain at this post until relieved or until measures can be taken for the removal of all Government property and the sick and wounded at the post hospital. With the remainder of my command I expect to march at 10a.m. to-morrow for Tullahoma, as directed in orders from district headquarters. I consider it my duty to state that in my view of matters here, the post McMinnville, Tenn., ought to be, at least for present, occupied by troops, not only for the protection of the many loyal people here, but also to prevent the numerous small bands of bushwhackers from collecting in a body, which they will certainly do if not continually harassed and kept dispersed by troops. I learn from Mr. Th. Comer, the trade agent at this post, that there are at present time $27,000 worth of goods and merchandise at McMinnville, all of which will have to be removed if the post be abandoned, as the citizens themselves are not capable of protecting themselves against these robbers and guerrillaa, and brought these goods here under the impression that they would be protected by military power. I am also satisfied that in the present famine-like condition of the poor classes, many who would otherwise remain quiet and peaceable will, under the continual pressure of want of the necessaries of life, engage in robbery and every other crime, unless restrained or overawed by troops; neither would there be any safety for the lives and property of several Union families here, for instance, of Dr. Armstrong, Captain Clift, General Rodgers, and other families and property. Should this post be completely evacuated, I would respectfully recommend that the citizens be made aware of that fact, and sufficient time given them for removal to other parts of the State. following is G.W. Doze's obituary. I do not have a copy of the funeral program, so I don't know the date of burial. George W. Doze, 92, died in St. Francis Hospital Monday afternoon after a long illness. The immediate cause of his death being dropsy. He had been a resident of Wichita most of the time since 1904 and a resident of Kansas since 1883, having filed on the first claim in McPherson township, Pratt county, where he resided until 1985 when he moved to Norwich. Born in Iowa, but reared as a boy in Missouri, he, early in life, learned carpentry and was a contractor during the active part of his long life, having built some of the first structures at Cairo, Saratoga and Cuillison in Pratt county, Kansas and Mullinville, Kiowa County, Kansas, and old Springfield, once the county seat of Seward county, Kansas. He also participated in two Oklahoma land openings. in the late 1870's he made an overland trip from Osceola, Mo. to Pueblo Colorado and became attracted by the possibilities of southwestern Kansas just then beginning to settle. In 1883 he moved to Pratt county Kansas making the trip overland. Burial will be at Norwich, Kingman County, Kansas, where his wife, who died in 1904, is buried. The services will be in charge of [sic] J.A. Green of Norwich and Byrd and Snodgrass of Wichita. The funeral awaits the arrival of W.W. Doze from Carthage. I sent George Washington Doze's family info back in Feb. or March. 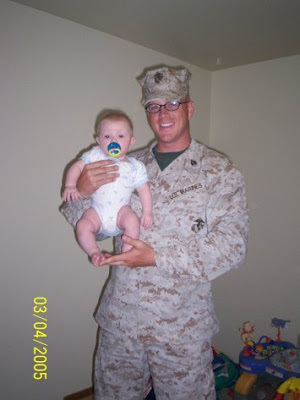 I believe I also sent a picture of him with his little grandson. George was the 8th child of Victor and Mary Bailey Doze. For those of you who may not remember, Victor was the eldest son of John Claude and MAry Barbe Doze (French immigrants.) Some of you may not have received the info above, if not, and you are interested in receiving Doze info from time to time, let me know. If you aren't interested in receiving anything, let me know that, too! If you have trouble with where George fits into the Doze genealogy, just let me know. I just got the following added to his history in my genealogy program and thought I'd copy and send along to you. I found this information at the Kansas State Historical Society in Topeka, KS years ago. He mentions his Grandparents as well as his father Victor in this history. A BIOGRAPHICAL HISTORY OF CENTRAL KANSAS VOL. 1, 1902, pp. 666-667. In every period of American history the people of France have sympathized with the Americans, in whose footsteps they have followed politically, and in every decade drom the beginning of the settlement in the colonies to the present time Frenchmen have been leaders among our pioneers and in our civilization and material progress. Kansas has reason to be proud of her citizens of French blood, and of such there is none in Kingman county more prominent or more highly esteemed than George W. George, the proprietor of the Norwich Roller Mills and police judge of the city of Norwich, who was born in America of French parents. George W. Doze is a native of Decatur Co, Iowa, where he opened his eyes upon this world November 23 1851 and is a son of Victor and Mary (Baily) Doze, natives of Lorraine, France. His grandfather, John Doze, was a soldier under Napoleon and fought at Austerlitz. Victor came to America at the age of eighteen years with his father and they located near Covington, Kentucky, where the elder Doze became a landowner. Later Victor removed to Decatur county, Iowa, where some years later he was joined by his father. Eventually he removed to Sullivan County, Missouri, where he enlisted in Company G, Eleventh Regiment of Missouri Cavalry, with which he served in the Civil War two years, until discharged on account of age, with the rank of major. Returning home he organized a company of home guards and after the war gave his attention to farming and stock-raising, becoming one of the most extensive land-owners in Sullivan county, an influential citizen and a leader in many important affairs. In politics, he was a Democrat. He died in August, 1881, aged eighty-five years, his widow in 1885. aged sixty-eight years. They were the parents of twelve children, nine of whom lived to manhood and womanhood. John is a farmer in Allen township, Kingman county, Kansas; Job is a farmer of Sullivan county, Missouri; Victor died in infancy; Julia is the widow of G.T. Mellan; Polly is the widow of Job Dodson; Margaret is the wife of John Hill, of Lyonsville, Iowa; Phoebe married C. Custer of Sullivan county, Missouri; George W. is the immediate subject of this sketch; Melvina died in infancy; Thomas Jefferson lives in Brown county, Nebraska; Frank lives on the old family homestead in Sullivan county, Missouri; and Peter is a farmer in Bennett township, Kingman County, Kansas. George W. Doze was the eighth in the order of birth of the children of Victor and Mary (Baily) [sic] Doze, who were married in Ohio. He grew up on his fathers farm in Sullivan county, Missouri, gained his education in common schools, and remained under his fathers roof until he was twenty-three years old. June 28 1874 at Osceola, Missouri he married Fannie C. Hahn, a native of St Claire county,Missouri and a daughter of Columbus and Gilia (Brown) Hahn, natives of Kentucky, who settled early in Missouri. For some years after his marriage he farmed in Sullivan county, Missouri, and after that gave his attention to contracting and building there until the fall of 1883, when he went to Kingman county, Kansas, remaining only a short time, and went thence to Pratt county, Kansas. He pre-empted land in McPherson township, in the county just mentioned, paid for it and remained on it until the fall of 1895, when he removed to Norwich, Kingman county, where he has since lived. Judge Doze was engaged in contracting and building at Norwich until October 1901 when he leased the roller mills there, then newly remodeled and equipped with the latest machinery. The mill has a capacity of sixty barrels of flour daily, and the flour made by Judge Doze is as good in every respect as any made anywhere. In politics he is a Democrat, and wherever he has lived, he has, since he grew up, been always active in political affairs. In his former place of residence he served long and ably in the office of justice of the peace. In September, 1901 he was elected police judge of the city of Norwich, the duties of which office he is performing justly and expeditously and without fear or favor. He is a member of the Independent Order of Odd Fellows. George W. and Fannie C. (Hahn) Doze have four children: Wallace W. and Edgar O. of Norwich, are up-to-date prosperous carpenters; J. Burtis is connected with the circulating department and reportorial staff of the Wichita Eagle; and Gertrude Lena died in Pratt county, Kansas, aged five years.